In recent years student housing has emerged as a highly attractive investment product on European markets. With the number of international students set to grow further and supply still limited, the future of this asset class seems bright. Stefan Kolibar, Head of Marketing at StudentMarketing talked about recent market developments. Stefan Kolibar will chair the student housing panel at the upcoming Prague Property Forum 2018. What makes student housing attractive as an investment product? After a decade of sector development in Europe, student housing transaction volumes have grown tenfold (from €720 million in 2007 to €6.9 billion in 2017). 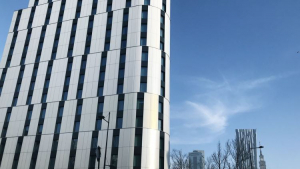 The development of the then heavily undersupplied private stock has been triggered by sector pioneers such as Greystar, GSA, The Student Hotel or Unite. Then, some year and a half ago, we saw the first institutional investors, pension funds and insurance companies starting to get involved in transactions which have changed the pace of sector development. These big players have accompanied the traditional sector players and are now looking for opportunities not only to build but also to buy existing portfolios in a number of cities. It says a lot about the asset class maturity level, liquidity, overall volume opportunity and still relatively good yields that are above the mainstream asset classes. How has the popularity of the student housing asset class changed over the previous years? We see two development vectors. Horizontally, it all started in the US, then moved to the UK and is now booming in Western Europe. Central & Eastern Europe is now considered as a new, emerging market. Vertically, 5-7 years ago, we saw investors being interested only in basic data and KPIs, they preferred quick surface city scans or market snapshots. Today, when there is more market maturity, development and supply and somebody wants to explore investment opportunities in Milan or Munich, they need to know everything about the city, so the data needs to have greater depth and scope – incl. demand, supply, pricing levels, pipeline, etc. down to some 200-250 KPIs. What types of investors are targeting student housing? Where are they coming from? There are all kinds of investors interested in student housing. Among big global investors coming from the UK, US, Canada, Singapore, China, Middle East or – very recently – South Korea, you can see pension & sovereign wealth funds, banks, insurance companies, family offices or high net worth individuals. There are also smaller investors who also develop and operate their premises. Which European countries and cities attract the most capital? In our recent asset class update at MIPIM in Cannes, we identified some 8 European markets, incl. France, Germany, Ireland, Italy, Netherlands, Poland, Spain and still the UK as a leading study destination, that provide better opportunities for student housing investors. In terms of cities, if you look at private supply vs international student demand numbers, cities with lack of private stock such as Vienna, Milan, Paris, Warsaw, Maastricht, Porto, Rome, Madrid, Hamburg or Munich would be one of the most interesting ones to invest in. 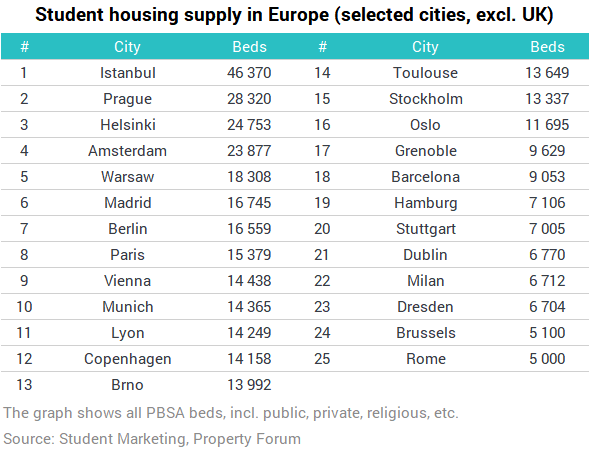 Which cities in the Central European region have the largest supply of student housing? Which cities will see a growth in supply during the coming years? If we look at the provision of private supply vs international student demand (excluding UK cities), it is obvious that the entire CEE region lacks in student housing supply and the data suggests that all major cities should see a growth. 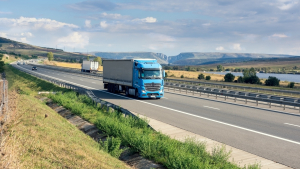 The list is topped by Vienna, with only 2% private supply vs international demand, followed by Warsaw (5%) and Prague (11%). According to recent studies, Vienna now lacks about 6,600 student beds and we see lots of opportunities here. The growth of investments is also expected in the largest CEE market – Poland, which is being driven by multiple strong university cities - besides Warsaw – you have also Krakow, Wroclaw or Poznan. We already see decent interest of both local and international investors in Prague and this is expected to grow, with Budapest and Brno being other interesting markets.